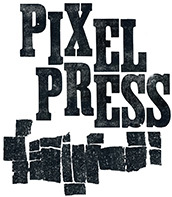 Pixel Press is an experimental printmaking space run by artists Julieta H. Adame & David Vassie in Stoke Newington, North London. It all started with us rescuing a lot of equipment from the skip, we detest the idea of seeing type and presses being turned into coffee tables, akin to toys being entombed in their packaging, never to be played with. A collaborative platform for people of different interests connected to language and printing. Art studio, publishing house, classroom. We also run workshops for people to experience the joy of letterpress, we like to share what we have learnt with professional printers, designers & artists, which we find not only a labour of love but a good time to be at one with oneself, away from your computer screen and smart phones.